Happy Mother's Day week! Our farm is buzzing with activity as we set up for our first weekend of Pick-Your-Own Strawberries, rides and a petting zoo for kids, delicious meals for everyone in our restaurant and a greenhouse bursting with blooms all at our Belleville location. I cannot wait for the weekend to get here! This week, I also wanted to test a recipe I had tucked away for Mile High Strawberry Pie before making it on Mother's Day for my mom. As with most recipes, we had to make it several times and tweak the ingredients to get to our most successful version. Boy, did our store staff love being a part of our sampling sessions! Thanks to lots of trial and error and input from our fellow baking friends, we revised the original recipe to arrive at this this deliciousness! The big trick is to whip the ingredients for the full 20 minutes as the recipe calls for. Don't cut this step short or you will miss out on maximum fluffiness!! Another cool tip regarding blind (empty) pie crusts baking came from one our sales reps who is a second generation baker. He recommends baking empty pie shells upside down (see photo). 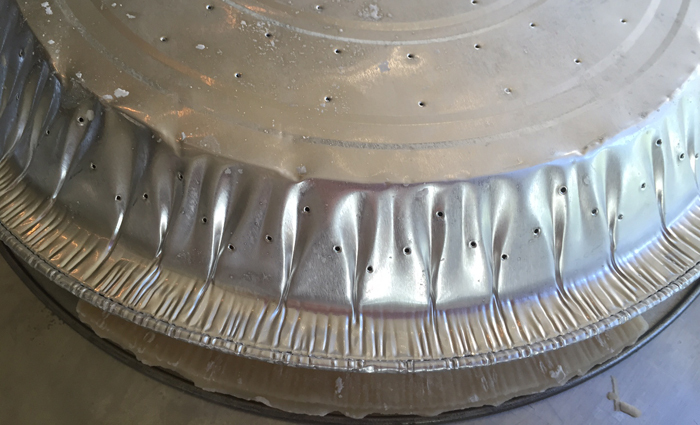 Place a pie pan on both sides of the pie dough and bake it inverted the pan. This allows gravity to do a little work for you and reduces the amount the pie shell shrinks around the pan rim. Cool huh? I hope you will give this recipe a try with your fresh Eckert's strawberries. It makes enough filling for the pie and a few extra bowls of crust-less fluffiness the kids (or your gluten-free friends) will adore. Happy Mother's Day! Pre-chill a 3 quart glass or stainless steel empty bowl. Combine granulated sugar and cream of tartar in a clean, dry 4 quart glass or stainless steel bowl. Add diced strawberries, egg whites and lemon juice. Beat on low speed about 2 to 3 minutes. Increase speed to high and beat for 15 to 20 minutes or until the mixture has quadrupled in volume and is very high, light and fluffy. In the chilled 3 quart bowl, add powdered sugar and vanilla. Beat whipping cream mixture until stiff peaks form, about 5 to 6 minutes. Gently fold whipped mixture into the strawberry filling mixture. Immediately pour mixture into cooled pie shell, reserving about 3 cups of the strawberry mixture. Freeze pie immediately. With the remaining 3 cups, pour into small freezer proof containers, cover and freeze. Remove the frozen pie or cups from the freezer about 1 hour before serving. Garnish with fresh strawberries. Makes 1 pie (6 to 8 servings) plus 6 mini cups (1/2 cup). Note: This filling is very flexible and does not have to be a ‘true pie’. It can be poured into a 9 x 13 pan and served as a crustless, frozen strawberry dessert as well.